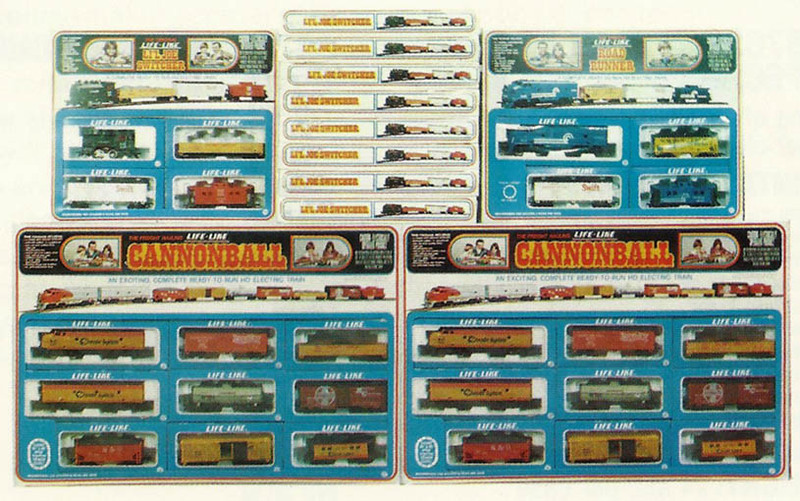 Promoted in 1970’s description by Life-Like as a, “L-O-N-G complete set,” this was an impressive offering in the original line. Up front was a powered F7A diesel locomotive matched with a non-powered F7B diesel locomotive. Road names listed, which would relate to the decoration of the two diesels and the caboose, show Baltimore & Ohio, Chicago & North Western, and Santa Fe. The set shows a $35 list price in 1970 and carried stock number 3P7B that year. For 1971, Life-Like renumbers this set to #T450. The set returns in Life-Like’s 1974 catalog with a $41 suggested retail price and 08128 stock number. The set is back again in 1976 with the same contents and listed as offered in Santa Fe (#08756) and Chessie System (#08755). This set makes appearances through the 1979 product catalog.